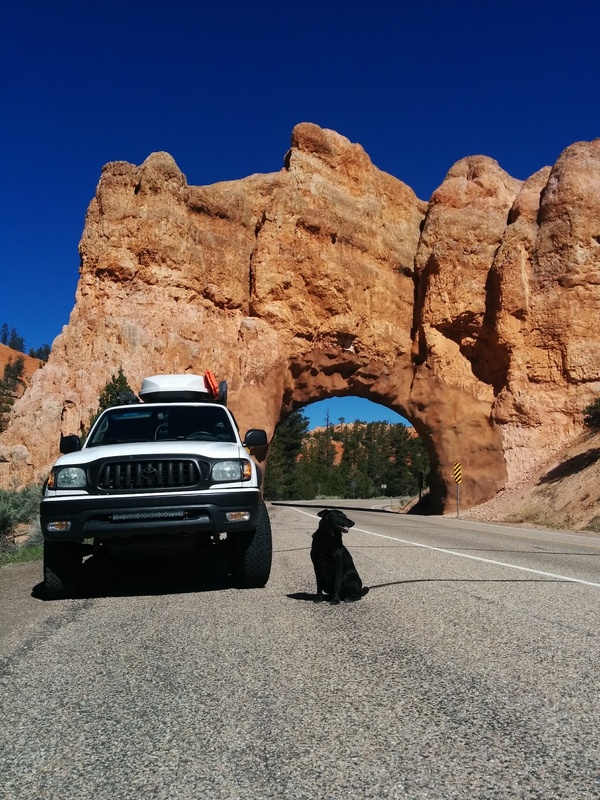 We approached the park from the West by way of the Red Canyon/Scenic Byway Route 12. It was there that we were first introduced to the extensive color palette (heavy on the reds) we would be enjoying for the next couple of days. 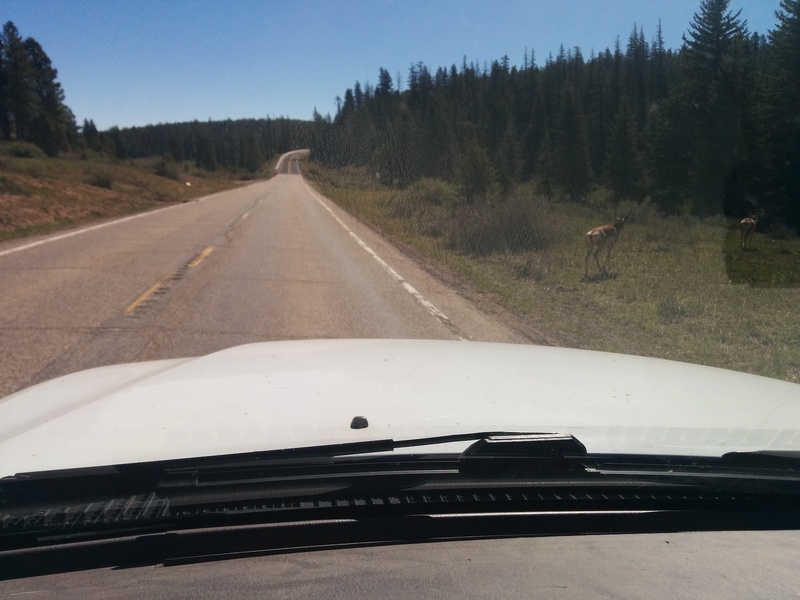 Before we arrived at the actual Park entrance where we usually take the traditional “dog-at-the-entrance-sign” picture we crested a hill and had to quickly slow down to allow several Pronghorn to take their sweet time to vacate the road. Off The Road And Back To Eating. Willow Trembling With Hope Beside Me. We soon came to the real entrance and got our needed picture there. Bryce Canyon National Park started it public life as a National Monument in 1923, became Utah National Park in 1924 and got its present name in 1928. We arrived around 11am (2017) and wanted to get to a few of the more iconic spots in the park before it got too hot. 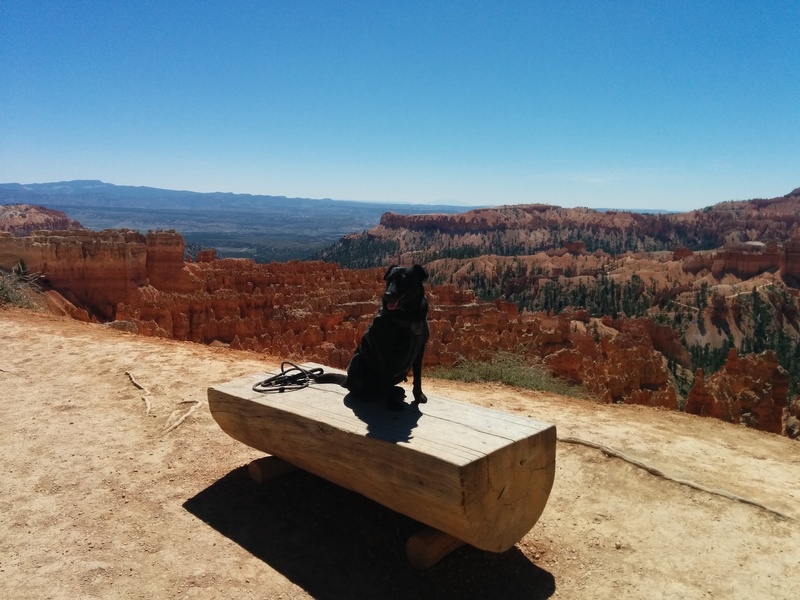 The first turnoff we saw was for Sunrise Point and so we turned in, parked, took the quick 2 minute walk to the overlook and grabbed a few pictures of my black dog against some stunningly scenic red-shaded backdrops full of hoodoos. 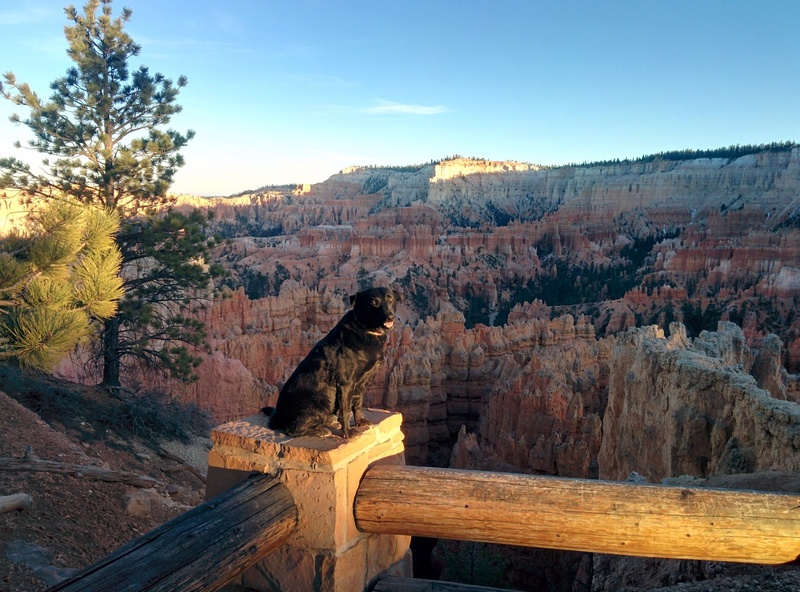 These distinct rock formations are not exclusive to Bryce Canyon and are found on every continent. This though is the largest collection of them anywhere in the world! We were trying to get these pictures while waiting for and working around easily hundreds of other tourists, mostly Asian, who had arrived in full-sized tour buses. Next time we might make use of the Shuttle Service. Willow seemed to be a great draw and she was friendly and patient as, literally, dozens of them asked to take her picture – some of just her, others as selfies with her or taken by a friend while they smiled and tried to look comfortable standing or kneeling so close to this awesome black predator. I should have taken pics of the picture-taking process as I’d have a whole gallery of forced-smiles, awkward-looks and tourists as they adjusted themselves to get close enough to the dog for a good picture but not too close as to be sniffed or touched by her. Quite amusing actually. Then, as we were walking away from the Sunrise Point viewing area, we had to pass through a growing queue of several hundred elementary-aged school children all being organized into their various classes by harried teachers and chaperones. Of course, Willow being Willow and having a veritable smorgasbord of one of her favorite classes of people (young kids) at her tiptoes we were slowed to a crawl as she met and accepted strokes and pats and squealing adoration from dozens upon dozens of her new-found fans. Once we were able to extricate ourselves from the crush of children we made it to the Tacoma to decompress and I took the opportunity to quickly skim over the handout we had received when we entered the park. Of interest to us (okay, me) is the geology that created such visual delights. 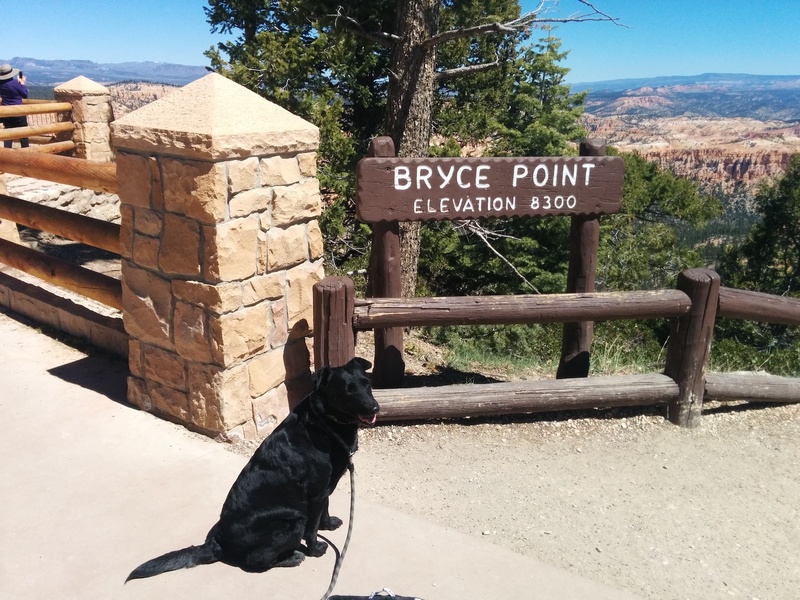 Bryce Canyon is somewhat poorly named as it is, in fact, not a canyon. It is instead a collection of 14 large, natural amphitheaters carved into the colored sedimentary rock of the Paunsaugunt Plateau over millennia. This particular area is part of the Pink Cliffs. Along the Plateau are other colored rock formations with name befitting their general coloration: Grey Cliffs, White Cliffs, Vermilion Cliffs and Chocolate Cliffs that collectively make up the vast geological area known as The Grand Staircase. Beginning around 55 million years ago these now exposed layers of the Pink Cliffs were mud and silt being deposited in shallow streams and lakes. The upper white layers are limestone deposited when the area was mostly shallow lakes. In the millions of years since then geological forces through a series of tectonic plate uplifts raised these layers above the surrounding lands and then erosion in several forms has removed materials leaving behind these structures. At Bryce Canyon and nearby areas the main force that shapes hoodoos is a process called frost-wedging. As snow and ice melt during daytime the water seeps into small cracks. At night when it re-freezes it expands and makes those cracks a little wider each time until they eventually fail and pieces break off. 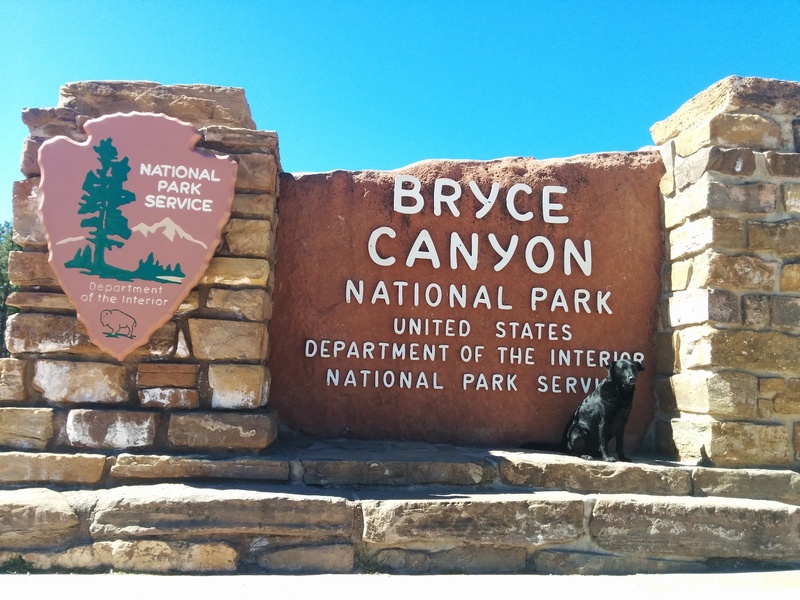 At Bryce the conditions that cause this where temperatures swing widely between warm afternoons and freezing nights happen about 180 days each year. The usual progression in the birth of a hoodoo starts as a thin wall of rock, sometimes called a fin. Hundreds of thousands of years of frost-wedging eventually create holes through the fin called windows. The windows eventually get so thin they collapse leaving columns and, with even more erosive forces working their magic, what eventually remains is a hoodoo. These remnants are visual representatives and some of the final reminders of the 525 Million years of geologic history that shaped the collective Grand Staircase area. The geology lesson is now over. From Sunrise Point we went to Sunset Point where we took a short hike South along the Rim Trail. At this point with the map showing us that there was so many more beautiful and interesting places to visit we decided to just be efficient in a “tourist-on-a-mission” sense and head down the list visiting each scenic point one after the other. 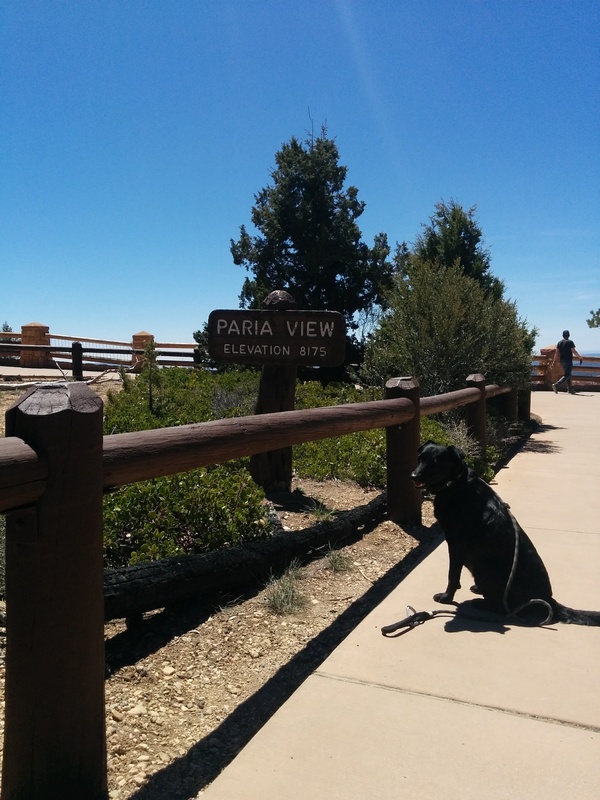 On our way back out from the Bryce Point and Paria View areas we stopped in at Inspiration Point. By this time it was close to 1pm and so a break for food and drink was in order. At some point this day we would have to figure out where we were going to camp that night and it just seemed easier to see if any vacancy was to be found at either of the two campgrounds within the Park itself. We asked back at the Visitor Center and were told Sunset Campground still had a few tent sites left. We decided to take the easy route so as not to have to figure out our plans and drive probably an hour or so later that day to other camping accommodations. 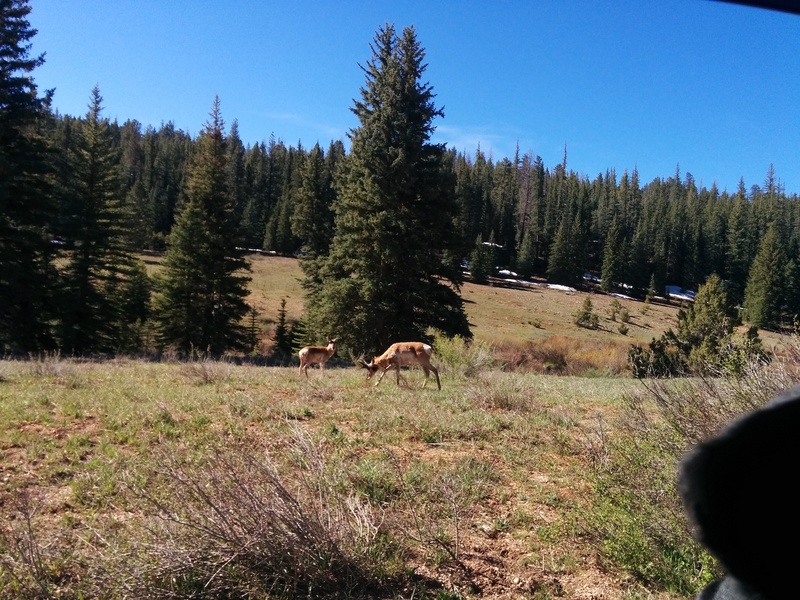 We drove through the campground and found that the ranger was not kidding when she said “a few sites left” as, according to the volunteer campground host, only 7 of the 102 spots in the campground were still unoccupied. That left us with not too many options and we did two complete, slow loops of the campground before settling on the least undesirable spot. It was merely “okay” being sandwiched on both sides by occupied sites and near enough to the dirt road that dust kicked up by passing motorists wafted our way. Since this was just going to be a quick overnight we left the vast majority of our stuff in the camper shell and only pulled out our Mountain Hardwear tent and cooking gear. 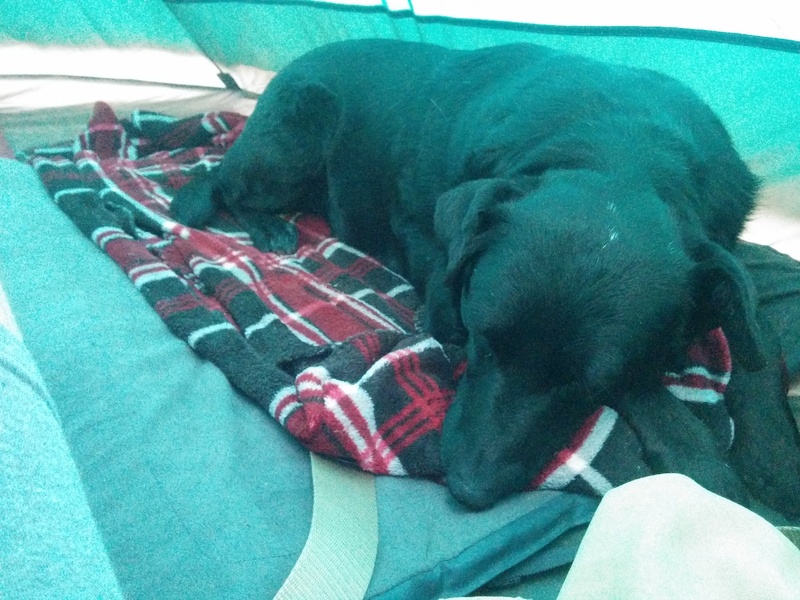 Willow was a bit tired after her trying day of jumping in and out of the Tacoma, walking, sitting on command and those numerous tourist selfies and she immediately went into the tent for a nap as I whipped up a quick lunch for me. Now that we were situated, camping-wise for the day we could relax and take our time. The post-lunch clean-up finished I roused my tired black dog for another round of posing and picture-taking at various beautiful vistas. We headed back towards the Park entrance and turned off on the appropriately named Fairyland Point Road. Here the hoodoos are younger than some of the other places we had visited so far that day. 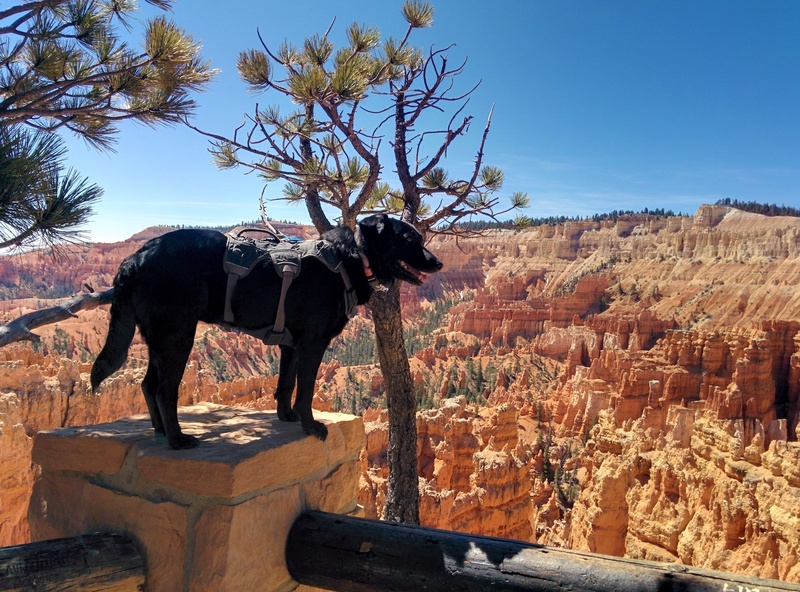 They are also a bit nearer to the observation platforms and closer to eye level than other collections of hoodoos in the park. By this time and after the several miles we had spent on our feet so far that day the post-lunch need for a nap had suddenly come on and we headed back to our spot in Sunset Campground to make that happen. 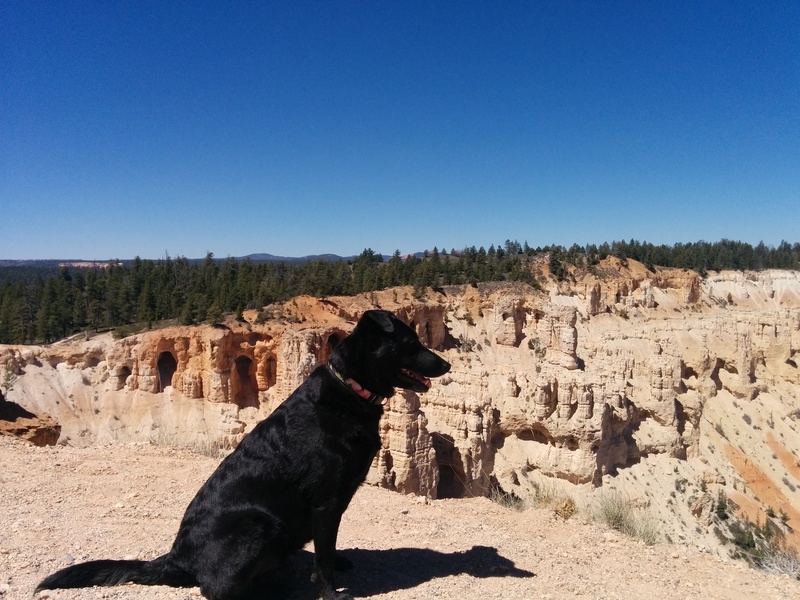 Two hours later we awoke refreshed and reinvigorated for the second half of our Bryce Canyon visit. We had seen mention of showers at the General Store up near the North Campground and decided to take advantage of the opportunity to scrap off the dust and dirt of the past week. An inexpensive $3 for a single eight minute timed session later and I smelled better than Willow once again. Back to our campsite and a couple more hours of sitting in the brisk shade catching up on some reading (Willow napped some more) when the (unoriginal) idea to be at Sunset Point during the actual sunset popped unbidden into my brain. To fuel that mission though we needed more calories so I made an early dinner (since we’d be heading to bed around 9pm anyway). So now, freshly rested, bathed and fed we did a quick clean-up and headed back out to retrace some of our earlier steps. Our pre-twilight mission at an end we headed back to camp, made a small campfire to ward off the flying insect patrol and then settled in for the night. 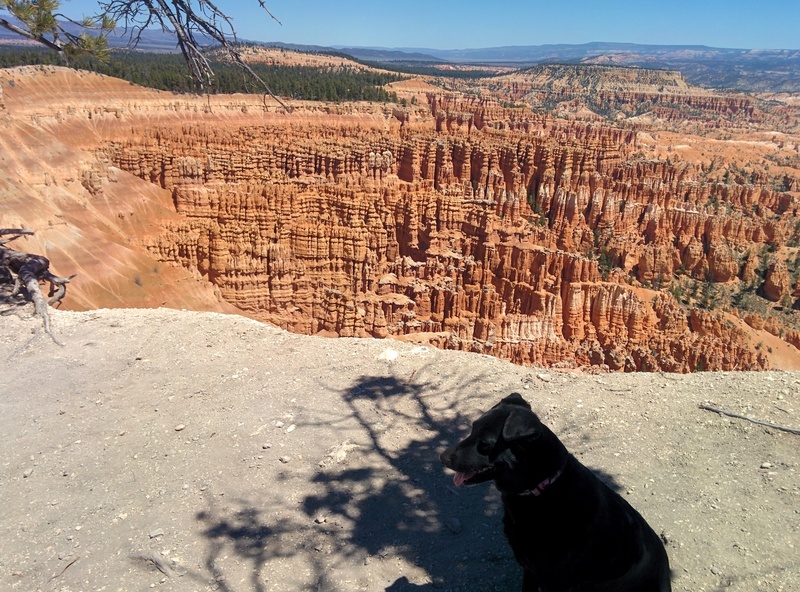 We had been told that Bryce Canyon is one of the better places to view the night sky and the Park offers Astronomy Nights. The high elevations, clean, dry air and lack of light pollution make Bryce Canyon one of the darkest places on Earth. On those nights when an Astronomy Night is offered, certain Park Rangers turn into Dark Rangers and host one or two-hour indoor multimedia shows on one of several night sky-related topics, lead night hikes and celestial viewing (weather permitting) with some donated powerful telescopes of various types. Sadly those programs were not offered that night and we were too tired to have attended anyway. Sleep is good. The next morning after a quick breakfast and not knowing, at all, where we were headed that day Willow was fortunate to catch the attentions of a nice lady. After brief introductions we learned she was from San Francisco and at the end of her own little adventure around this area. 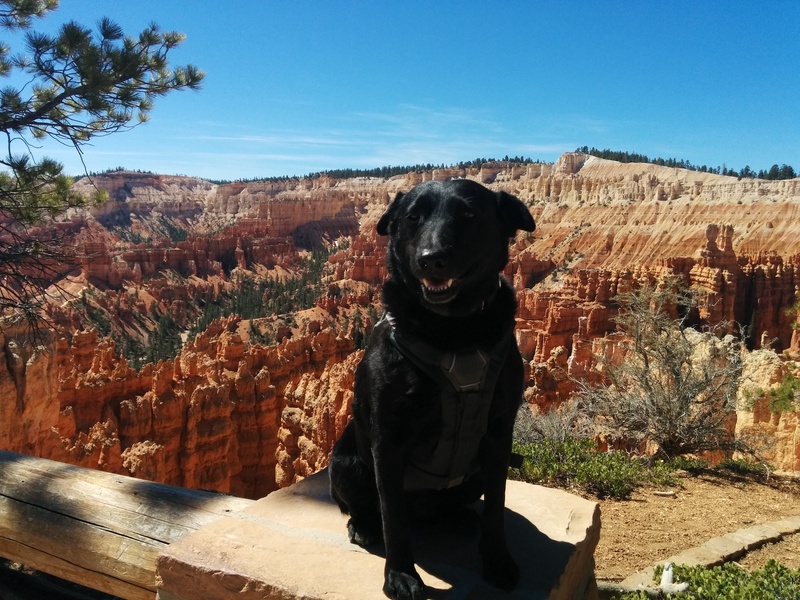 She mentioned a gorgeous hike in a slot canyon with water flowing through it about an hour away and so we thanked her for her input, wished her well on the rest of her adventure and decided right then and there to head towards the Willis Creek Slot Canyon. Once we were all packed up and heading out of the Park AT&T stopped sucking for a brief moment and we pulled to the side of the road to look up and get directions to the slot canyon and started in that direction but that is a post for another day. 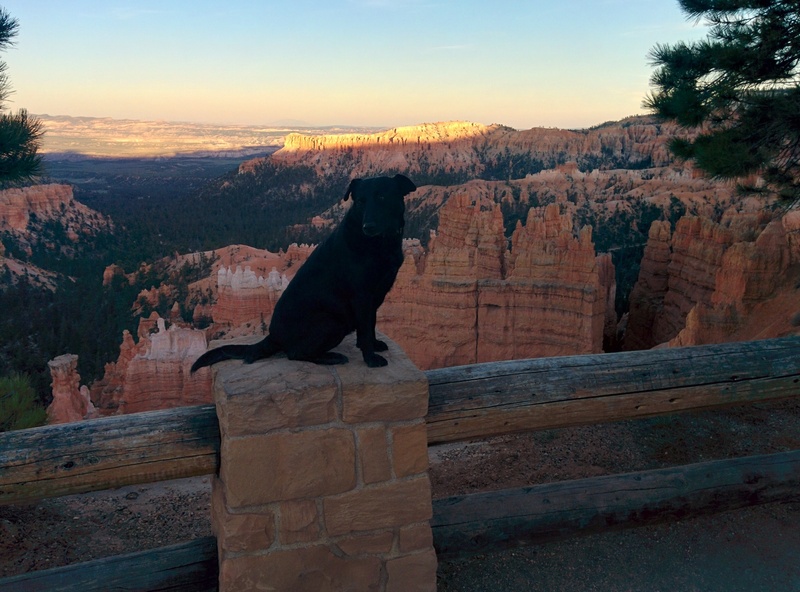 Bryce Canyon National Park offers its visitors a variety of activities to enjoy. 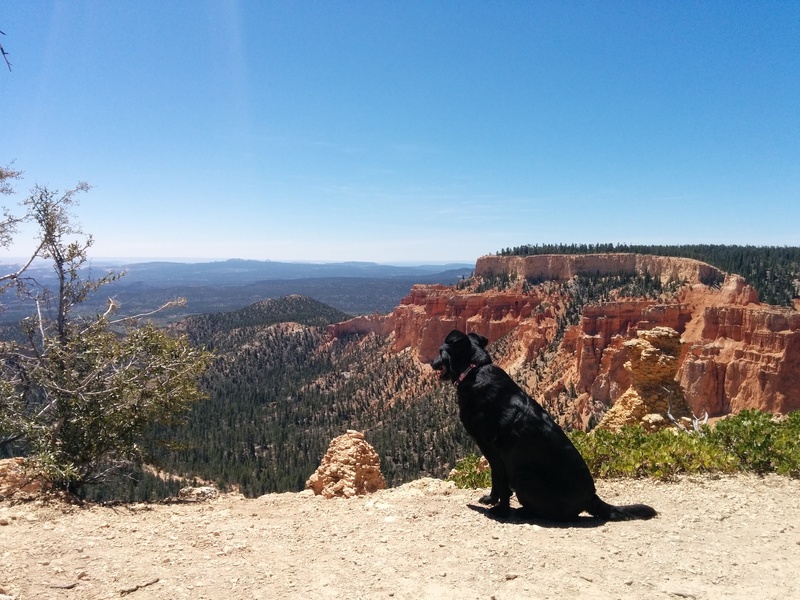 Hiking, animal watching, interesting human and geologic history and some of the finest night sky viewing to be found anywhere. 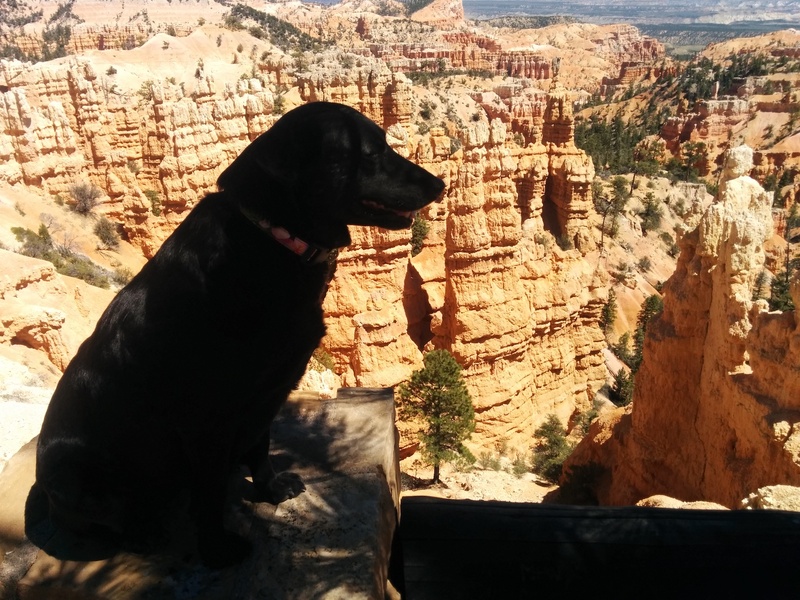 In our 24 hours in the Park we saw the results of hundreds of millions of years of geology at work, got in some nice hiking and Willow met about 100 people who squealed with delight at meeting her. If you find yourself in the area we highly recommend you stop by and take in as much of what it offers as you are able. 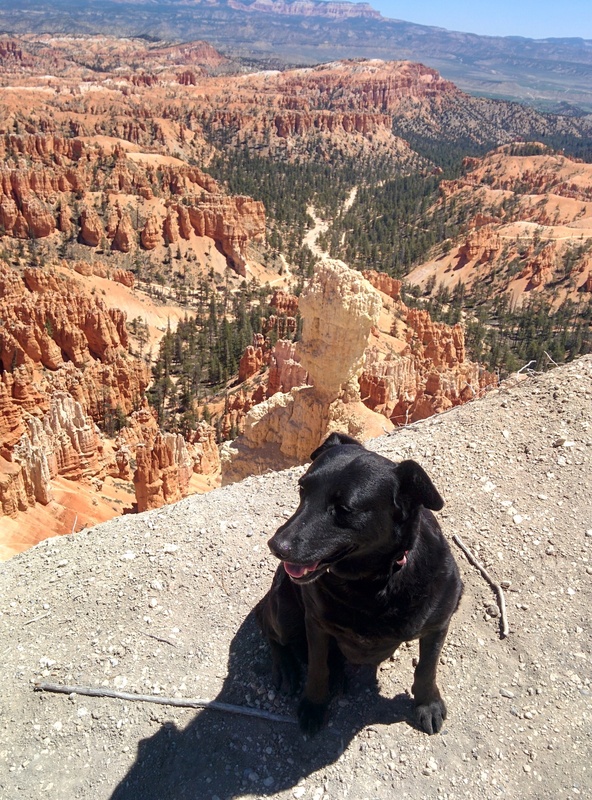 In our estimation, all by itself, it is worth planning an entire destination vacation around this stunning area in South Central Utah. If you’d like more information a great place to start is their official website.